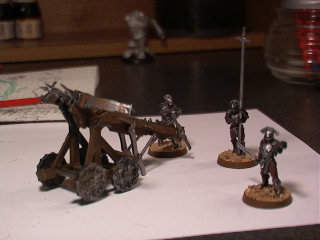 How to paint Uruk Siege Ballista! 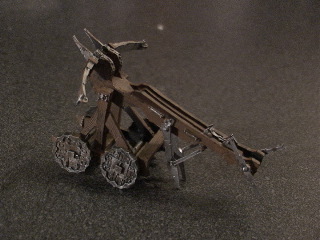 I have painted a lot of miniatures in my time, and I've seen a lot of quality models, but this Siege Ballista, for what it is, is just stunning. The wood grain texture along the wooden pieces of the model are very finely done, and to get this and three Uruks for the price is really worth it to me, this piece definetly gets the Flinch Seal of Approval. Let's get started. Assemble your model as instructed on the back of it's box, then spray a very fine undercoat of Chaos Black over the entire model. Paint the wooden areas of the model with a few thin coats of Bestial Brown, be very careful not to over do it as you don't want to take away the lines of the wood. Now lightly paint the metal areas with Boltgun Metal and feel free to highlight any areas you feel the need with Chainmail. 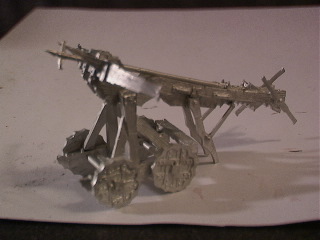 This is a very simple model to paint, once assembled, so now all you need to do is lightly dry brush some boltgun metal to give this War Machine some wear and tear and you're set, don't forget to check out our Uruk-hai Guides for help painting up your Uruk Support Crew.